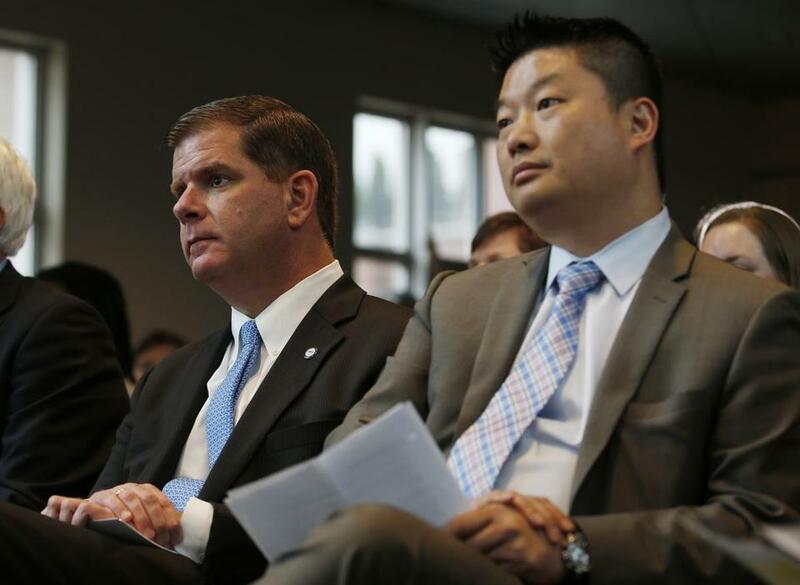 Mayor Walsh and School Superintendent Tommy Chang sat together before announcing the record-breaking enrollment numbers for Boston summer learning programs on Thursday. Boston will offer summer educational opportunities to nearly 12,000 children this year, Mayor Martin J. Walsh announced Thursday, more than doubling the number of students served in 2015. Walsh said the rapid growth “shattered” his goal, set in July, of expanding the number of children served to 10,000 by 2017. The city, which had 79 programs in place last summer, will now work with 120. Students will be learning not only in traditional classrooms, Walsh said, but through experiences in workplaces, the Boston Harbor Islands, the Blue Hills, and at Berklee’s City Music Boston program, a music education initiative for fourth- through 12th-graders. Schools Superintendent Tommy Chang said summer gives students opportunities to pursue personal interests and develop curiosity. The city’s summer programs, he said, integrate academic study with experiences that enrich learning. Chang said research shows that the “summer slide” — learning lost when students spend months out of school — accounts for two-thirds of the achievement gap between ninth-grade students from low-income families and those from wealthier families. Chris Smith, executive director of Boston After School & Beyond, a central partner in the city’s summer programs, said children born into poverty, on average, spend 6,000 fewer hours learning in preschool, after-school programs, and summer programs than middle-class children. The city’s program, called the Boston Summer Learning Community, seeks to address that imbalance. Jeremy C. Fox can be reached at jeremy.fox@globe.com.